Vincent van Gogh, 1890. Kröller-Müller Museum. 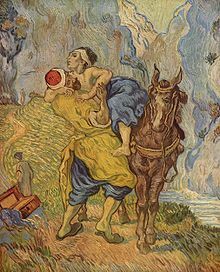 The Good Samaritan (efter Delacroix). Conscience is an aptitude, faculty, intueetion or juidgment that assists in distinguishin richt frae wrang. This page wis last eeditit on 19 August 2017, at 04:01.